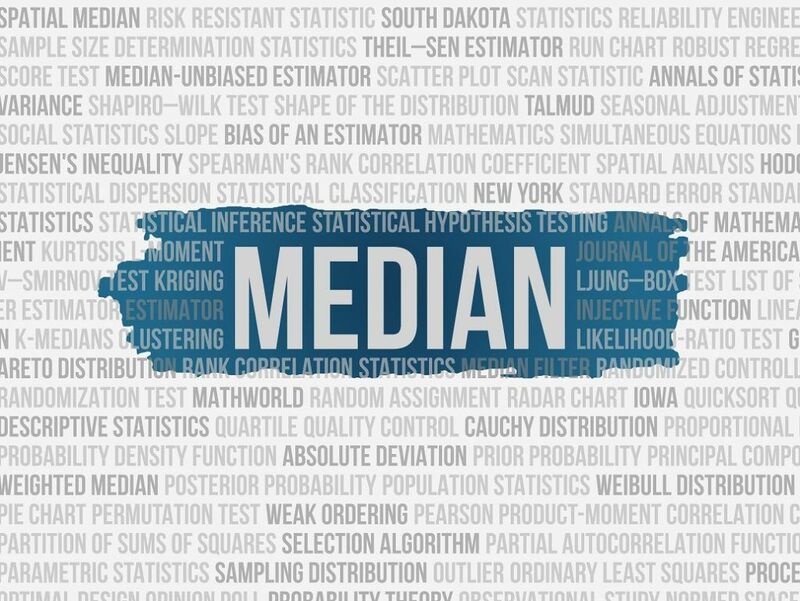 Median is a statistical measure that determines the middle value of a dataset listed in ascending order (i.e., from smallest to largest value). The measure divides the lower half from the higher half of the dataset. Along with mean and mode, median is a measure of central tendencyCentral TendencyCentral tendency is a descriptive summary of a dataset through a single value that reflects the center of the data distribution. Along with the variability. Although mean is the most commonly used measure of central tendency for quantitative data, median can be used instead if the data contains large outliers. The outliers generally skew the mean while the median is not affected by extreme values. Sometimes the two measures are used simultaneously to determine the value that describes the central value the best. Arrange the data in ascending order (from the lowest to the largest value). Determine whether there is an even or an odd number of values in the dataset. If the dataset contains an odd number of values, the median is a central value that will split the dataset into halves. If the dataset contains the even number of values, find the two central values that split the dataset into halves. Then, calculate the mean of the two central values. The mean is the median of the dataset. You are an equity research analystEquity Research AnalystAn equity research analyst provides research coverage of public companies and distributes that research to clients. We cover analyst salary, job description. Currently, you are working on the valuation of one of the large-cap IT companies in the market. You’ve already created a DCF model, but you want to check the results of the model using comparable analysisComparable Company AnalysisHow to perform Comparable Company Analysis. 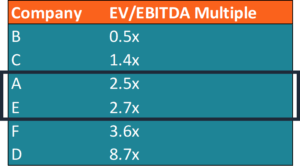 This guide shows you step-by-step how to build comparable company analysis ("Comps"), includes a free template and many examples. 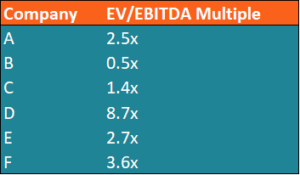 Comps is a relative valuation methodology that looks at ratios of similar public companies and uses them to derive the value of another business. For the comparable analysis, you’ve determined the pool of companies. 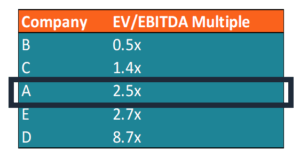 The primary analysis metric is the EV/EBITDA multiple. 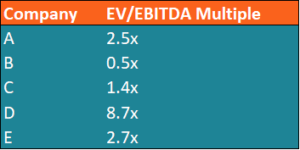 Since the obtained data contains some extreme values, you believe that the median will be the best central value in such a scenario. 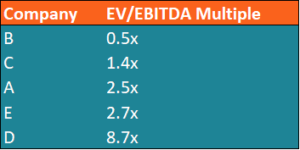 Scenario 1: You identified five comparables. Arrange the data in ascending order. The dataset contains an odd number of values. Thus, the median is the central value that splits the dataset into halves. In our example, it is the 5x multiple. 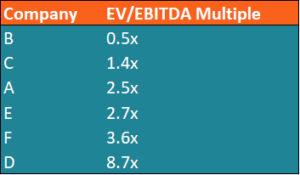 Scenario 2: There are six comparable companies. Arrange the data in the ascending order. The dataset contains an even number of values. Therefore, we need to find two central values that will split the dataset into halves. The median of the dataset is the average of the two central values indicated above.